Website and processes: 13 Mar 17 Grandma, 4/5 Good "I was unable to book time slot"
Microlight trial lessons are an increasingly popular way to enjoy light aviation, and our Microlight Trial Lesson allows you to experience the thrill of flying: it will even count as the first step towards your Private Pilot's Licence. The flexwing microlight has a tandem seating arrangement - your instructor will generally ask you to sit in the P1 seat at the front - don't worry all instructors on these types prefer to sit in the rear seat anyway, it's the norm for them and s/he can oversee you all the time in the air. 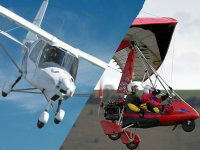 3 axis microlight usually have two seats side by side. The student will then be allowed to take the controls and actually fly the aircraft! The weather plays an important part in all forms of flying, but Microlights are a little more susceptible to the elements than other forms, so please bear that in mind. The voucher will have Clench Common printed on it, but it can be used from..